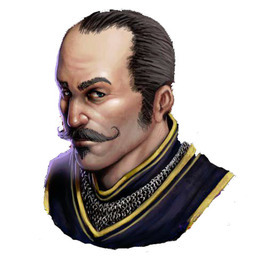 Sergeant Rosyter McCleagh is a gruff old campaigner with a handlebar mustache and salt and pepper hair. He is rarely seen without his greatsword and banded mail. An aged soldier and longtime retainer of the Smythees, Sergeant McCleagh maintains discipline and training among his small corps of troops on Tidewater Rock. McCleagh is fiercely loyal to Lady Agasta Smythee. Gossip among the servants is that he secretly loves her, but refuses to act on it out of devotion to the late Iron Bert Smythee.